I am a tree lover. If you’ve been visiting for long, you already know this about me. This week these banners went out into the world. Framed by eco-prints and embroidered with eucalyptus dyed silk thread… perfect for the job, I think. 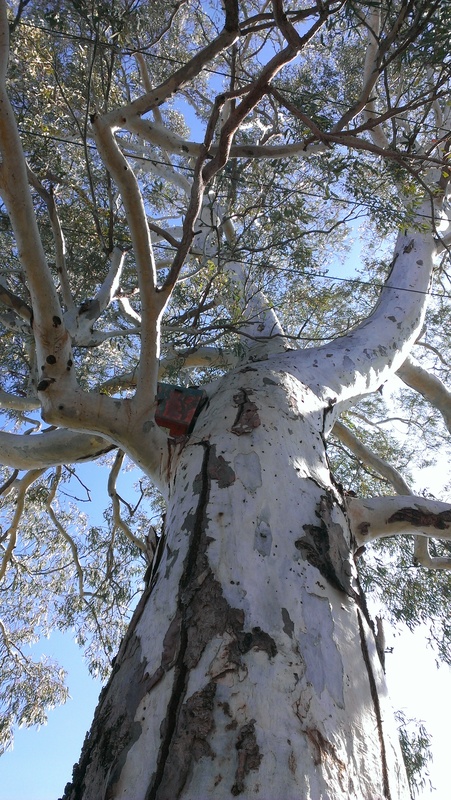 The first went to a river red gum we managed to save during railway works in the neighbourhood. But the second banner went to a much larger tree. 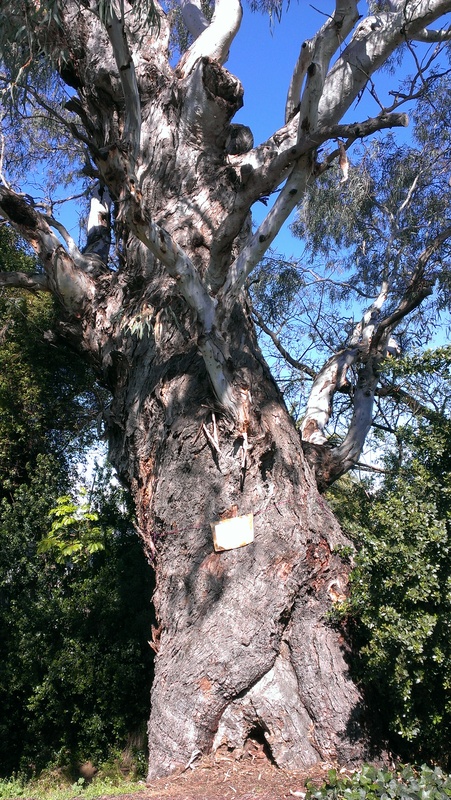 This one has been here since the Kaurna people were the only people living here: since before colonisation. It is now in Wilberforce Walk, and it is threatened by flood mitigation works which will widen Brownhill Creek, in which it stands. It has a massive trunk. Friends and neighbours have been at work on making sure this tree stays safe. We have been writing letters and submissions. We have been lobbying. One ingenious friend has commissioned a beautiful painting of this tree by local artist Laura Wills which he is planning to give to Council. 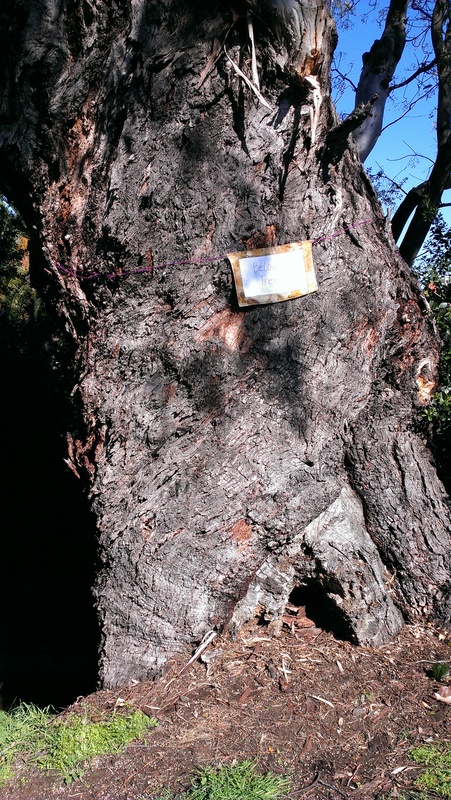 Other ingenious friends had a famous eucalypt specialist come and examine the tree to assess its age and state of health and write a report. 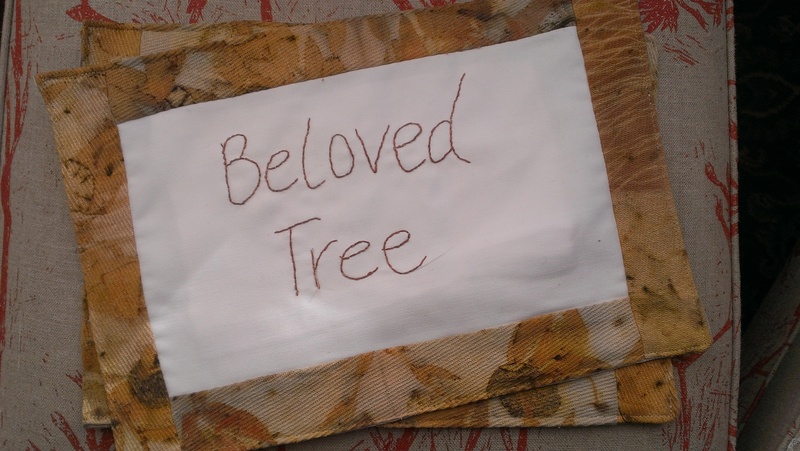 This banner has been requested several times by various other people who love this tree, and now it is in place. 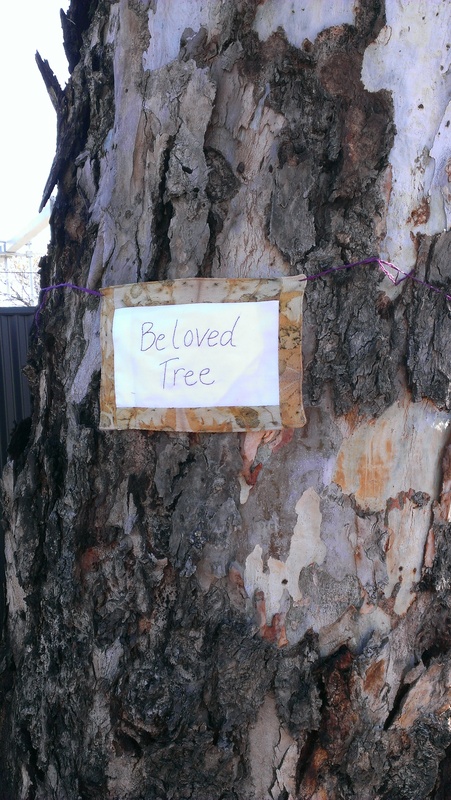 I don’t think it can hurt for passersby, or the Council’s arborist, or whomever might be charged with deciding how to treat this tree, to know that it is beloved. It has been wonderful to meet with so many people who love this tree after years of visiting it and treasuring it myself. 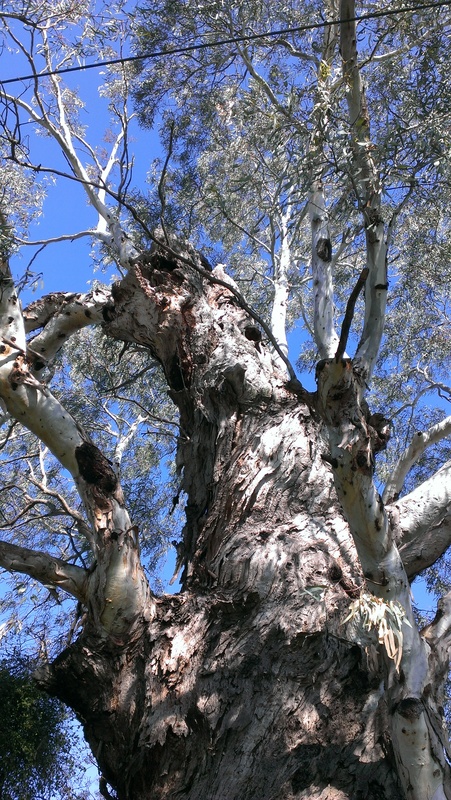 Along with the other tree lovers: in this case, friends, neighbours, insects, honeyeaters, sulphur crested cockatoos, bees and tawny frogmouths. Long may your sewing and dyeing arm remain strong! fabulous tree – long may you reign over your worldspace! Isn’t it glorious? Thanks for cheering me on…. Been out of touch……too many emails!! So sorry I missed this one! what a wonderful tree and history. Love it.